Macao, a special administrative region of the People’s Republic of China bordered by China and the South China Sea has a total land area of 11.39 square miles and a population of over 544,000. It is an offshore financial center whose economy is heavily dependent on gambling, tourism, banking, financial services, and garment manufacturing. It is a tax haven and a free port. October through December are the tourist friendly months. Macau’s old-world charm alongside its casinos and skyscrapers adds to the reason it is considered as a holiday getaway. Portuguese influence is still prevalent in certain areas like the Senado Square, the Ruins of St. Paul, and regions of Taipa and Coloane. Other attractions are A-Ma Temple, Guia Fortress, the various churches and cathedrals, temples, fortresses etc. As almost all of its terrain is taken up for various human activities, the territory has neither forests nor woodlands, but the various well-kept gardens make up for it. Macanese cuisine is a fusion of Portuguese and southern Chinese dishes - bacalhau (salted cod), pato de cabidela, chili shrimps, and rabbit stewed in wine are a few of their popular dishes. Strolling in Macau. 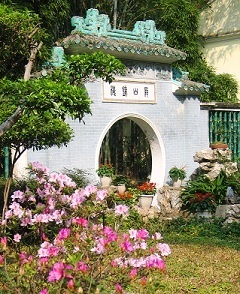 A Visitor’s Guide to Macau, Taipa, and Coloane 978-0971594098 $12 Excellent guide book to help plan a trip by foot in Macau. Macau Insight Flexi Map 978-9812585943 $8 Laminated. Included recommended sights. The first stamps of Macau were a long set of fifteen stamps released between 1884 and 1885 showing the Portuguese Crown in different colors. The set (Scott #1 to #15) catalogs for around $900 mint and around one-third that for used. Portugal’s control over Macao was firmly established following the Opium War of 1839 to 1842. The Sino-Portuguese Treaty of Amity and Commerce of 1887 formally established Macao as a Portuguese Colony. Several surcharge overprints over the first set followed until 1887 when a set of three stamps in the Coat of Arms theme appeared. That set (Scott #32 to #34) catalogs for around $40 mint and $25 used. A set (Scott #35 to #44) of stamps portraying King Luiz and King Carlos along with surcharge overprints on them were the primary stamp issues of Macao until 1913. Macao released a long set of twenty nine Ceres keytypes between 1913 and 1924. The set (Scott #210 to #238) is very valuable and catalogs for around $1750 mint and $375 used. Several overprints and certain keytypes portraying Portuguese colonial history were the primary stamp issues of Portugal until 1948. Chief among them were a long set of twenty one stamps released on February 1, 1934 showing an allegory of Portugal and Vasco da Gama’s Flagship San Gabriel. That set (Scott #268 to #288) catalogs for around $900 mint and around $200 used . A set of twelve stamps released on December 20, 1948 showing local scenes. The set (Scott #324 to #335) is sought after and catalogs for around $650 MNH and around $60 used. The designs show Macao Dwelling, Pagoda of Barra, Mountain fort, View of Macao, Praia Grande Bay, Leal Senado Square, Sao Jeronimo Hill, Marginal Avenue, Relief of Goddess Ma, Gate of Cerco, Post Office, and Solidao Walk. A set of eight stamps released on August 8, 1966 in the Soldier theme. The set (Scott #404 to #411) catalogs for around $55 MNH and $10 used. The designs show Drummer (1548), Soldier with sword (1548), Harquebusier (1649), Infantry Officer (1783), Infantry Soldier (1783), and the three highest denominations portraying Colonial Infantry Soldiers. A set of three stamps released in 1978 in the Legislative Assembly theme. The set (Scott #440 to #442) is sought after and rare and catalogs for around $120 MNH and around $5 used. A set of four stamps released on September 30, 1987 in the Gambling theme. The set (Scott #551 to #554) catalogs for around $30 MNH and around $10 used. The designs show casino gambling games: fan-tan, cussec, baccarat, and roulette. A government issued monopoly controlled the gambling industry in Macao since 1962. The industry was opened up in 2002 which resulted in the American gambling industry entering Macao in full force. The first coins of Macau were Portuguese Colony Standard Coinage (100 Avos = 1 Pataca) Bronze Avos issued in 1952. The issue has average mintage (500K) and catalogs for around $30 in UNC. Macau has issued a number of gold coins and commemorative proofs over the years and they are valued at a slight premium over bullion value. Coins $3 and up Common UNCs from the 1980s onward starts around $3. Recent High Values in UNC, Bi-Metal UNCs, Commemorative Recent Color Proofs, etc start around $10. Commemorative Lunar Year Silver Proofs start around $50. Gold Silver Proofs, and Gold Coins go well into the 100s and 1000s. Paper Money $2 and up Common Patacas in UNC from the 2000s starts around $2. Recent ZZ replacements in UNC, High Value UNCs, etc start around $10. Bundles, Rare Specimens, etc go into the 100s. Duty-free items, wine, tobacco, jewelry, salted fish, antiques, porcelain etc. are the popular buys of its visitors. Miscellaneous Collectibles $3 and up Souvenir Stickers, Patches, Badges, Magnets etc start around $3. Hand-painted Macau collector plates, 20th century historical photographs etc start around $30. 19th century local scenes prints and photos start around $50.